Inside diameter of the tire is wide enough for even the largest pooch. 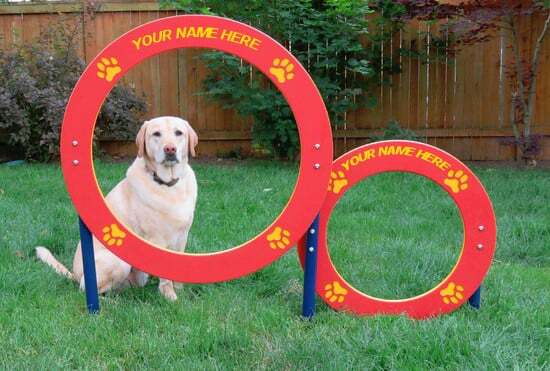 Smaller hoop sits just above ground level and is suitable for small dogs including low riders like Basset Hounds! 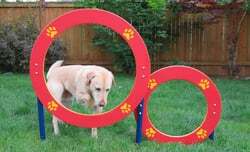 Once your dog has mastered the jump, try doing a series of Figure 8’s, so that your dog jumps through the hoop, then immediately turns around to jump through going the opposite direction. Features 100% recycled HDPE hoops and 80% recycled aluminum posts. Uprights are rust-resistant aluminum with a powder coat finish. Optional surface mount plates for installation on concrete, roof tops, etc and have an addt'l lead time.